Stock-market bulls are cheering midterm election results that, as expected, saw Democrats take control of the House and Republicans hold control of the Senate, delivering a split Congress and expectations for legislative gridlock over the remaining two years of President Donald Trump's term. 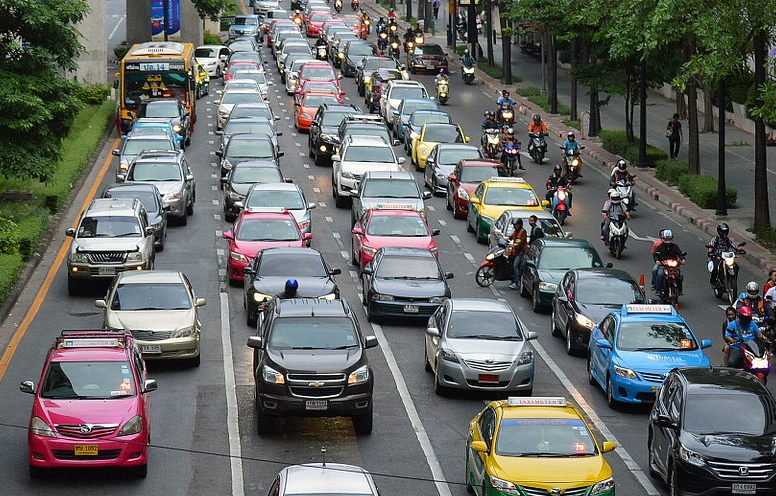 "Gridlock is good" is an oft-heard mantra when it comes to stocks. It comes from the notion that the likely inability of lawmakers and the president to accomplish much means politicians won't be able to do much harm nor to undo market-lifting measures already in place. The chart below from Bank of America Merrill Lynch helps explain why investors have faith in the concept. 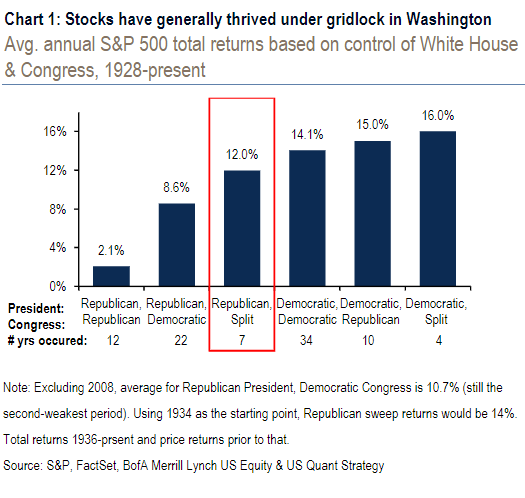 As the chart shows, since 1928, stocks have produced an annual average return of 12% in years when a Republican president held office and control of Congress was split between Democrats and Republicans. 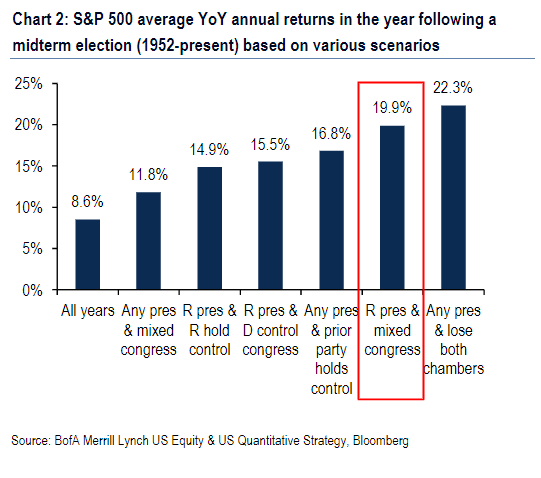 And in the year following a midterm election that resulted in a Republican president and a split Congress, returns have averaged more than 20%, one of the highest returns of all the scenarios the analysts explored, though they noted that the sample size of midterm years is small (see chart below). The S&P 500 ended more than 2% higher Wednesday, while the Dow Jones Industrial Average advanced more than 500 points, with stocks extending gains ahead of the closing bell. For stocks, "the key positive" from the 2016 Republican sweep that saw Trump win the White House and Republicans control both the House and Senate was the corporate tax cut enacted late last year, while the administration's trade battles with China and other partners is now weighing on multiples, the BAML analysts said. "Thus gridlock (nothing done, nothing undone) might not be a bad outcome, and has historically been a good environment for stocks," they wrote. The Senate results, meanwhile, will give Republicans more breathing room heading into 2020, which means there is a greater likelihood the corporate tax cuts will survive regardless of the outcome of the presidential election in two years, said Jeffrey Schulze, investment strategist for ClearBridge Investments, an affiliate of Legg Mason, said in a phone interview. Meanwhile, expectations that a split Congress will prevent Trump from seeking further tax cuts and restrain lawmakers from adding to a rapidly growing budget deficit set the tone in the Treasury market, analysts said. And curtailing, or at least slowing, a rise in yields could remain a near-term positive for stocks. Indeed, action in the Treasury market Tuesday night and Wednesday morning appeared to reflect the ebb and flow of election results as much, if not more, than stock-index futures. Treasurys weakened, pushing up yields, as early results indicated Republicans could potentially hold the House. Those losses were reversed, pulling yields back down, as it became clear Democrats would manage to win control of the lower chamber. Yields were mixed in afternoon trade, however, after . a poorly received auction of 30-year bonds The yield on the 10-year Treasury note edged higher in afternoon activity, up 0.7 basis point to 3.219%. "It'll be interesting to see if the gridlock slows the pace at which the deficit has been rising and the Fed has been tightening. There may be a view Democrats will rein in fiscal spending," Michael Arone, chief investment strategist for State Street Global Advisors, told MarketWatch. "This could be a case of bad news being good news for stocks. Perhaps gridlock makes further rate hikes from the Fed less likely, because fiscal policy has accelerated economic growth temporarily," he said. "Under gridlock, that's likely to end sooner rather than later." Those factors were also seen putting pressure on the U.S. dollar. The ICE U.S. Dollar Index a measure of the currency against a basket of six major rivals, was off 0.3%. A stronger dollar has been seen as a headwind for equities, with the index up more than 4% since the end of 2017. "Further weakening would be good news for U.S. equities, by mitigating one of the recent drivers of downward revisions to earnings expectations," said Lori Calvasina, head of U.S. equity strategy at RBC Capital Markets, in a note. While Democrats may favor more infrastructure spending, it's likely any moves on that front would be as fiscally neutral as possible, said Bill Diviney, senior economist at ABN Amro, in a note. With tax cuts and the previous spending increase in the rearview mirror, the pace of growth is due to slow down, Diviney said, which could also undercut Trump's re-election prospects. At the same time, the outcome probably won't put any significant limits on Trump when it comes to trade policy, said Larry Hatheway, chief economist at GAM Investments, in a note. "At this juncture, it remains premature to draw strong conclusions," Hatheway said. "Insofar as potential escalation of trade conflict remains a key concern for global growth and the performance of non-US equity markets, investors will likely remain hesitant until further clarifications of policy intent are forthcoming."